Listen Up! When is an #audiobook better? When do you decide to listen to an audiobook instead of reading the story? For me, I pretty much continue to read books in series that I’ve been reading, and I use audiobooks to catch up on books/series I’ve had on my wish list/TBR. But it’s not always that simple. Listening to a story gives the “reader” a completely different experience than reading it. Sometimes one way works better for a reader than another. 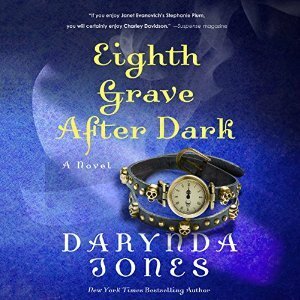 Recently, I decided to listen to Eighth Grave After Dark by Darynda Jones, rather than read it. Here is a series in which I’ve read every book and had planned to read this one as well. However, I struggled reading the last two books in this series, with certain aspects of the characters’ actions and the overwhelming number of storylines making it difficult for me. Knowing that the narrator is one of my favorites, I opted to break the string of reading and listened to the story instead. In this particular case, I feel I made the right decision. I was able to let go of some of my issues and just enjoy the narrator share the story with me. On the other hand, I feel that I may have enjoyed Anne Bishop’s The Others series a bit more had I read the books. Part of the reason is the narrator, who is a bit slow. However, I think it’s also the writing style, which can be very drawn out and detailed. When listening to a book, I am not able to skim and selectively read pieces and parts, which may be may be better suited for this type of book. Finally, there are books where it doesn’t matter, like the Mercy Thompson series by Patricia Briggs. These books are so engrossing and well narrated, that I can and do flip-flop mid-book between the audio and written word. These are the books I just can’t put down and can easily drift between the two different media. So what about you? Are there books, series, narrators, or authors you will only “read” in one format or another? Have you ever switched mid-book or mid-series? I don’t listen to as many books as I should because I do read much faster than narrators narrate. LOL But, I do the same thing as you, if I’m struggling with a series I know I like, I take a break and listen to a book or two in that series. It makes the characters come alive and I’m invested again. Have you tried speeding up the narration? I listen to several narrators at the 1.25x speed. It helps a lot. I also listen in the car (but only when alone, can’t with kiddos!) and on my walks. I’m totally addicted. I now always have two books going: one audio and one ebook/paperback. Yes, I agree, listening to a book takes longer than reading it, but it is a good way to get in another book when you can’t sit and read!! Stacia Kane’s Downside series was one that I couldn’t get into the first book when I tried to read it. It was the heavy street slang that got me. I love them on audio but once I caught up in the series I tried reading one when I got the eARC. I can now listen or read the books but I heard the narrator’s voice in my head when I’m reading and it really helps me with the slang. One series that really blew my mind when I switched to audio was Mercy. I love King’s narration but she was not how I pictured Mercy sounding so I’ll switch back to reading for the series. For me King isn’t Mercy. She made her sound too light. I bet the audio helps a lot with books that have a lot of slang. 3) Stephanie Plum series by Janet E.
I’m listening to the Jane Jameson series right now. It’s a bit weird for me because I’ve already read/listened to the Half-Moon Hallow series, which happens after Jane’s books. The first book felt a bit slow to me (listening now), but I have a feeling things will pick up more as I get into the series. I agree. ALL of Molly Harper books. So I don’t know that I would enjoy White Trash Zombie as much if I read them. Love the narration. I enjoy EA on audio but the last few I’ve read but have the audios on my wish list. I need to get back to Kevin Hearne’s Iron Druid series. I’ve both read and listened to EA. I enjoy both! I find that I prefer my urban fantasy books in audio form. I’m currently working my way through The Mercy Thompson series, Psy-Changeling series, Elemental Assassin series, and the Kate Daniels series on audio. Something about that genre just works for me in that format. I listen as often as I can, which for me is a lot. Driving, working, housework, even while playing video games with the sound turned off.. I don’t like to listen to books I’m going to review, though. I’ve done it a few times, and it’s just harder for me when I can’t take notes or go back and find a quote I liked. I agree that writing reviews for audiobooks is tough. I am a note taker, and I take the notes on my phone. With audiobooks, I review “for fun,” so I take fewer notes. I try to write down some thoughts as soon as I’m done listening, so when I do write a review, I remember the key points. The Dresden Files is read by James Marsters (i.e. Spike from the Buffy series). He’s an awesome narrator and brings the characters alive. Listening to him makes me like this series even more. I’ve heard great things about his skills *wink* I’ll have to add that series to my wish list! Thanks!! its honestly depends for me. I have certain narrators that I love and so I will listen to those books that are on my TBR list and that are audio. But also the price plays a part in it too. But I just love audio books and sometimes if its a author I have a hard time getting into with the books they write, i will try it in audio format and have a much easier time of it. I agree that cost plays a role. I’m lucky that so many of my TBR list is available on audio from my downloadable library. Using OverDrive is pretty easy on my iPhone. I listen because I’m able to mutlitask and get more books in a year than if I read alone. There are books that I listen to just because I can get to it sooner, but there are others that I will do on audio because the narrator adds to the the story. I’ve totally moved The Dresden Files up on my wish list. That isn’t a series currently on my TBR, but I’ve heard such great things, I think I’ll try it out!